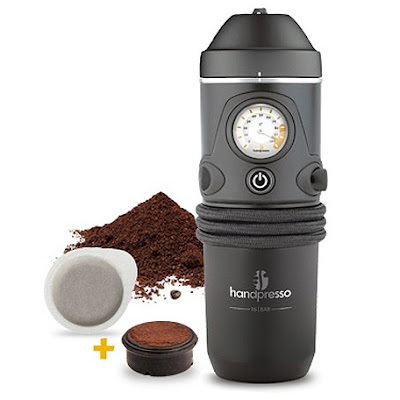 Handpresso Auto is here. And the new Hybrid version accepts both ESE pods and Domepods (for ground coffee). Handpress Auto is the first 12V espresso machine, a revolutionary machine preparing a premium quality espresso in the car! Handpresso Auto helps you optimize your coffee break wherever you are. Simple and easy to use, Handpresso Auto can be placed in the cup holder. Just plug the espresso machine into the 12V cigarette lighter, add water and a E.S.E. coffee pod or ground coffee (using the supplied Domepod) of your choice. Then press the button, wait for the 3 beeps and the espresso is ready! Thanks to the 16 bar pressure, the espressos are delicious, creamy and tasty! + 25 paper cups for free. Hybrid versions takes both ground coffee and ESE pods.